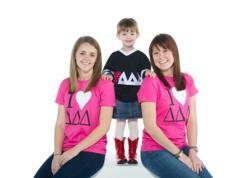 Delta Delta Delta has record-breaking year in fundraising for St. Jude Children's Research Hospital. Sorority is halfway to $15 million in just two years. Tri Delta sisters from the University of Mississippi visit with St. Jude patients. Members of Delta Delta Delta Fraternity have gathered in Tucson, Ariz., this week for the organization’s 54th biennial Convention, and today, the Fraternity announced that during the 2011-2012 academic year, its collegiate and alumnae chapters have raised $4.2 million for St. Jude Children’s Research Hospital. This $4.2 million donation is part of the Fraternity’s latest pledge, made in 2010, to raise $15 million in 5 years for the hospital. For the 2010-2011 academic year, Tri Delta raised $3.7 million, and since Aug. 1, 2010, Tri Delta has donated a total of $8.5 million for St. Jude. Tri Delta had four chapters raise over $100,000 in just one year: Louisiana State University, University of Mississippi, University of Alabama and University of South Carolina. This marks the first year any chapter has raised more than $100,000. Additionally, the organization had three alumnae chapters that raised more than $10,000 in one year: the New York City Alumnae Chapter ($19,965), the St. Lawrence Alumnae ($12,150) and the Fredericksburg, Va., Alumnae Chapter ($11,250). Also recognized at the luncheon were the top collegiate chapters from each group who have raised the most money during the 2011-2012 academic year. The gold group includes chapters with more than 131 members, the silver group includes chapters with 91-130 members, and the blue group includes chapters with 90 members or less. In the gold group Louisiana State University raised the most with $126,000; in the silver group, Rhodes College raised the most with $100,000; and in the blue group, Oregon State raised the most with $64,000. The flags for these schools will be hung in the Tri Delta Patient Care Floor at the hospital in recognition for all their support. This is the third fundraising goal Tri Delta has set for St. Jude in the past 11 years, is dedicated to the naming of one of the St. Jude Specialty Clinics, which ensures patients receive expert care for specific needs. In 2010, Tri Delta completed its $10 million goal, six years ahead of schedule, which went towards naming the Tri Delta Patient Care Floor. Since opening 50 years ago, St. Jude Children’s Research Hospital has changed the way the world treats childhood cancer and other life-threatening diseases. No family ever pays St. Jude for the care their child receives and, for every child treated here, thousands more have been saved worldwide through St. Jude discoveries. The hospital has played a pivotal role in pushing U.S. pediatric cancer survival rates from 20 to 80 percent overall, and is the first and only National Cancer Institute-designated Comprehensive Cancer Center devoted solely to children. It is also a leader in the research and treatment of blood disorders and infectious diseases in children. St. Jude was founded by the late entertainer Danny Thomas, who believed that no child should die in the dawn of life. Join that mission by visiting stjude.org or following us on Facebook and Twitter.